Can I just say that the slow cooker rocks?! I’m sure those of you who use them regularly will agree. Fast forward a few hours. Through 1 grocery store trip. Through lunch. And through getting kid #1 on the bus. When I remember again that I haven’t started the slow cooker. Spray the slow cooker. Dump in the coconut milk and stir in the curry powder (plus some salt and pepper…crushed red pepper for any of you spice-aholics). Add the chicken. Top with the frozen vegetables. Give it a little toss. Set on high for 6 hours…will be ready by 6! Be on your way to preschool. This was quite the interesting meal. I can tell you that the right side of my mouth really enjoyed the meal, while my left side doesn’t quite agree. Scrumptious…it really was. At least according to the right side of my mouth. Shake the coconut milk vigorously. Pour into the base of a lightly sprayed slow cooker. 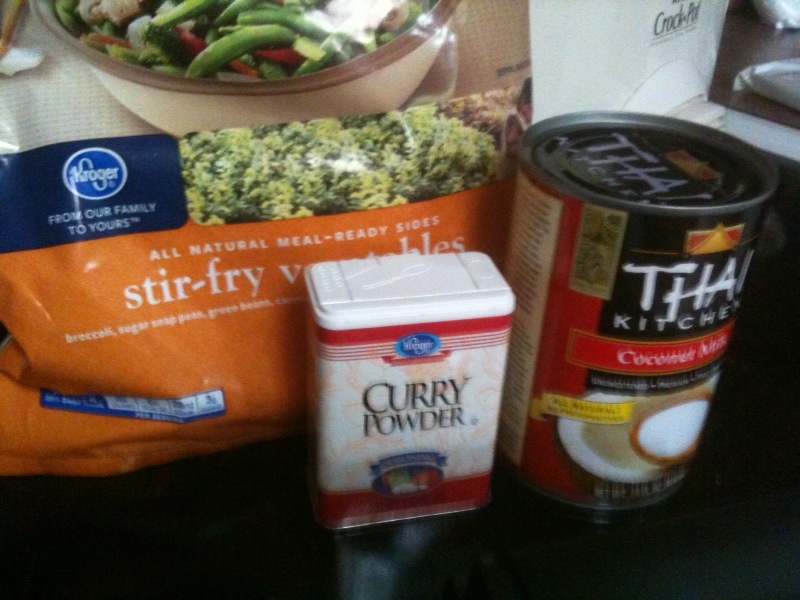 Whisk away any chunks of the coconut milk if necessary. Whisk in the curry powder and salt and pepper. Place the chicken breasts into the coconut milk and spoon some of the milk over top of the chicken. Top with the frozen vegetables. Set slow cooker on high for 6 hours (or low for 8-10 hours) and let it fill your home with an amazing aroma as it cooks all afternoon/day. 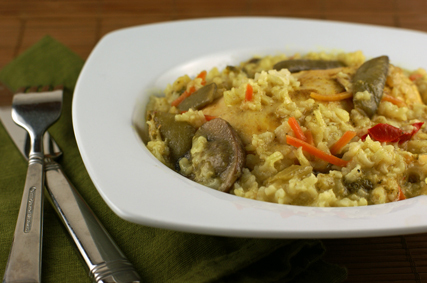 Serve the Curried Coconut Chicken and veggies over the rice. Great coupon for coconut milk – I usually wait until it’s on sale to stock up. Thanks for the coconut chicken recipe. I am always looking to make chicken more interesting. Sounds delicious!! And perfect for all the chicken I stocked up on when it was clearanced for $0.99/lb a while back. Let’s just say I purchased about 11 3-lb packages of boneless/skinless chicken breasts that trip…LOL! Does the chicken have to be thawed or can it be frozen when you put it into the crockpot? Perfect timing! I just found frozen breasts and stir fry veggies in the deep freeze. This will be dinner tomorrow. 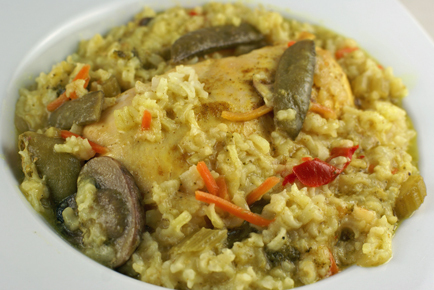 The curried chicken and rice looks wonderful! Great flavors! Thanks! Thanks for another great recipe and carnival! MMM….I often make chicken curry in my skillet but will have to try it in my crock pot. My whole family loves this dish and that is hard to do and usually 1 person won’t like something….my philosophy is oh well! Can’t wait to try this in my crock pot. Is the end of the instructions on # 1 supposed to say “Top with the veggies? ?” Sorry, I’m a little OCD about following recipes! You never explained what to do with the vegetables? Do they cook in the chicken and milk sauce all day in the crock pot or do you steam them separately and layer them at the end. Perfect! I was just trying to think of something for the slow cooker for this weekend!! Thanks! I love anything with coconut! That looks so delicious. I am going to have to try that soon. I use my slow cooker a lot and am always happy to find new recipes! This was great. I only had two hours so I put it on high and it worked fine. I also used fresh veggies (I happened to have yellow and red peppers and mushrooms) and brown rice. The chicken was a little frozen when I put it in too – no problem. My hubby loved it so much we have no leftovers!!! My son liked the chicken and rice, but not the veggies – no surprise there. I did add a little lite sodium soy sauce to mine when I ate it. Thanks! Made this tonight. I put the veggies in at the beginning with the chicken because that’s what the recipe indicated. However, next time I think I’ll put them in at the end – they got a bit mushy. I’ll probably use a bit more curry and maybe some jalapenos for some heat next time too. Husband really liked the curry/ginger in the rice. My family enjoys eating coconut and using coconut in many different ways but this is a new and very interesting chicken recipe we will definitely try. Really like he fact that it uses a slow cooker and it is basically easy to do. Thank you for sharing! Great recipe! The only tweaks I have made are -adding 2-3 tbsp of mild curry paste instead of using dried curry (more flavor) and putting my veggies in at the end. this was a disaster! I cooked on low for 5 hours, it burned and cracked my crockpot. so much for frugal recipes- now i’m out the cost of the ingredients AND a crockpot!!! Delish! So easy to make and all 3 children ate it! Put the chicken breasts in and 8 hours later they were so tender I just shredded them in the sauce and put over rice. Thank you for this recipe! So tasty. I added 2 tbsp cornstarch mixed with cold water about 1 hour before finish, as my broth was soupier than I like.